Must Be Comfortable With consists of a series of comedic sketches, all along a theme. In this case that theme remains focused on the treatment/state of women in theatre and the acting profession especially. Plenty of grist for the comedic mill there! Now, my own taste isn't usually for polemic humor unless done extremely well. You do this now and then. At its best, the zingers not only hit target but make us laugh and sometimes even think! The skits in this range from above average to excellent. Perhaps the surest test of this lies in this fact--I found myself wondering whether in a recent play I'd committed the same gender-based nonsense targeted (for the record--I think not, although it worries me someone could slant a production that way...). That and the fact I laughed. When I didn't laugh, I was usually smiling. Sometimes in a grimace, and/or in discomfort--but then, such does rather remain the point. Generally the quality of the skits varied a bit. I don't quite think the (very clever) take on the famous Four Yorkshireman sketch worked, although the audience still laughed. The casting meeting in a reverse world where women are deciding which male actor is young and attractive enough to be the love interest for Helen Mirren lacked guffaws but made up for it with sharp wit. Personally, I thought the glimpse into what it would be like if other professions--scientist, accountancy, dentistry, etc.--treated women the way movies do combined best the humor and discomfort. Some of this quality lies less in the writing (although certainly there) than in the performers--but as a playwright myself that comes as no real surprise. 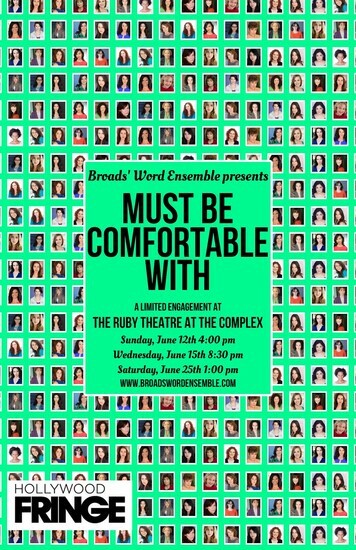 One rarely sees a really large cast with pretty uniformly high quality, but this one had it, so kudos to Sylvia Lohendorf, Tara Donovan, Dana DeRuyck, Lacy Altwine, Danielle Ryerson, Esther Mira, Lea Matthews, Jessica Shim, Marian Gonzalez, Natalie Ochoa, Dionne Neish and Chevonne Hughes! Must Be Comfortable With plays Saturday June 25 at 1pm in the Ruby Theatre, part of the Complex 6476 Santa Monica Blvd.